This well presented, 4 bedroom family home offers you multiple living zones for your family to enjoy. Relax on the covered front verandah and enjoy the water and mountain views. Entertain your family and friends on the sun filled, private courtyard/patio. When you enter the home, the spacious rooms and high ceiling areas provide you with a great sense of space. The home offers three internal living zones and two external living zones with the design bringing the indoor and outdoor living areas together perfectly. The original kitchen has been replaced with a large, modern kitchen offering plenty of bench space, lots of storage and views to Bonville Creek. There are 3 bedrooms on the ground level and one guest bedroom area (bed 4) on the lower ground level. The master bedroom is an impressive size being 4.5m x 3.8m with plenty of built in robe space and a large ensuite. Bedroom 2 & 3 have built in robes and are 3.5m x 3.0m each. The guest bedroom area has a full ensuite and is open to a third living area which could be utilized as a teenager retreat or accommodation for an extended family member. The double garage features direct access into the home, the gardens are relatively low maintenance and the kids will love to play in the sunny, grassed back yard. Recent updates include a fresh paint and new carpet. A great family home in very good condition and ready for you to move in. 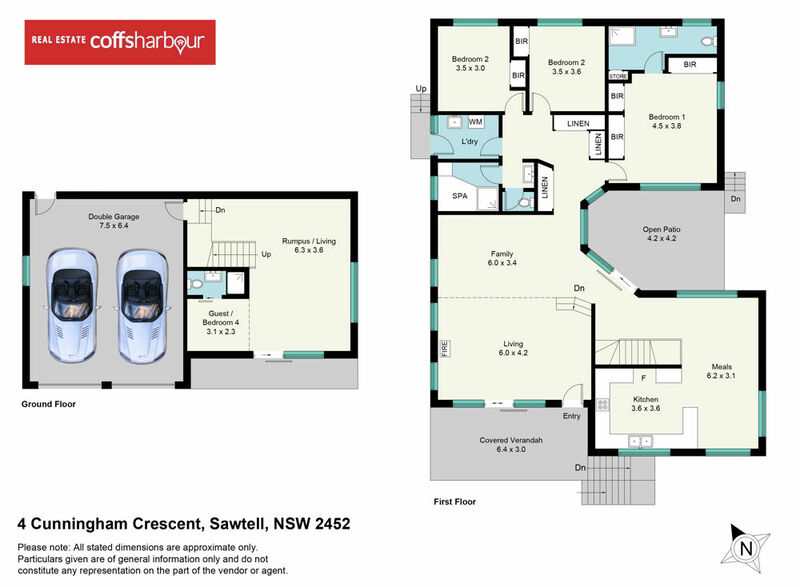 Search realestatecoffsharbour.com.au for more information.